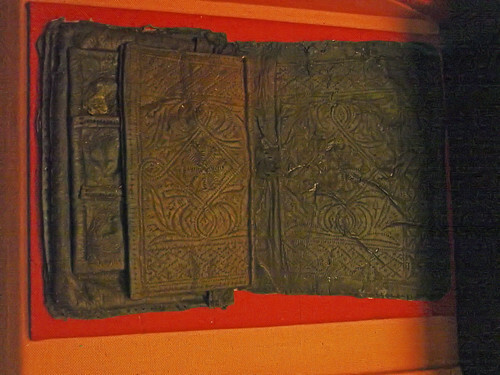 The Museum of London leather jerkin in close up photographs. 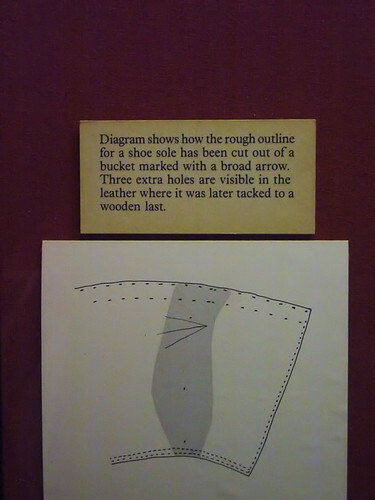 Thanks to the Archaeological Leather Group for pointing it out. I’ll be making a quiver or two later, so stay tuned. If anyone is interested in 15th century leatherwork, woodwork, or any aspect of maritime construction, the Newport Ship have their Specialist Reports online. The introduction of the Fabric Specialist Report gives some background of the ship. In 2002, during the construction of the Riverfront Theatre, on the banks of the River Usk in Newport, South Wales, an archaeological find of great significance was unearthed. In the summer of that year, while undertaking the excavations for the theatre’s orchestra pit, the well-preserved remains of a 15th century clinker built merchant vessel were discovered. Be prepared for turn-welted poleyns, leather pump components and an archer’s bracer (MSG 154 on p90). I’ve finally managed to get organised enough to upload my photos from the Mary Rose Museum. “Mary Rose leatherwork”, or a variant on that theme is in the top 5 searches on this blog nearly every day, so there seems to be some demand for it. The museum features very low light to protect the finds from UV degredation, so the colour in the photos tends to be a bit muddy. Some of them have had a lot of work to pull the image from what at first appeared to be a black frame. I’ve arranged the photos by item type, starting with archery equipment and then move on to other items. You may have seen some of these photos before but hopefully most of them will be new. The photos also link through to my Flikr account. I’ll update the descriptions when more information becomes available. 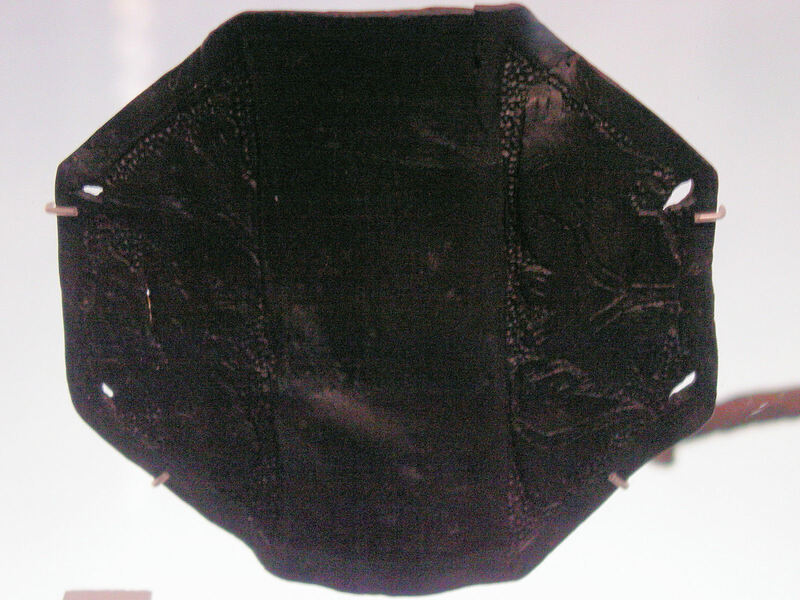 Leather bracer embossed with the royal arms of Henry VIII. 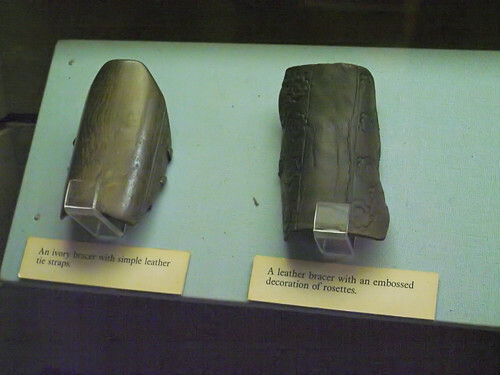 Left: Ivory bracer with leather straps. 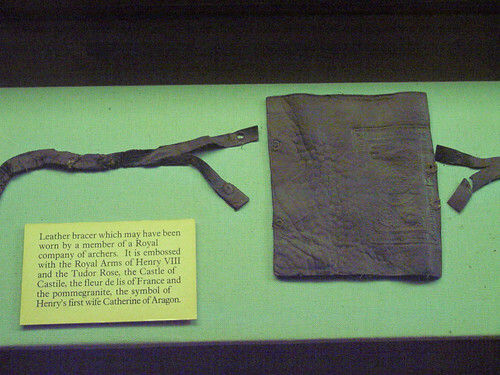 Right: leather bracer, with stamped rosettes. Left hand mitten (both mittens found were for the left hand). I suspect these were used to protect the bow hand when shooting fire arrows from a longbow. The triangular shape of the thumb cut out can be clearly seen. Fingertip detail of left hand mitten (both mittens found were for the left hand). 260mm long, 150mm wide at widest point. 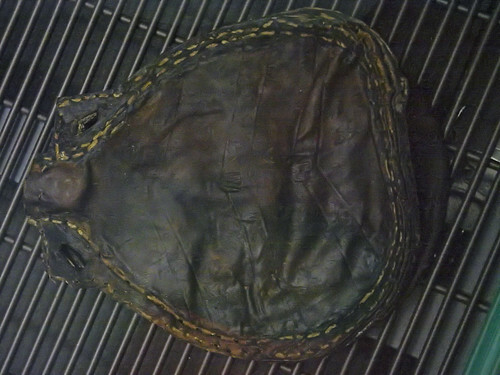 Unidentified leather, the other one found (81A3292 was sheepskin). 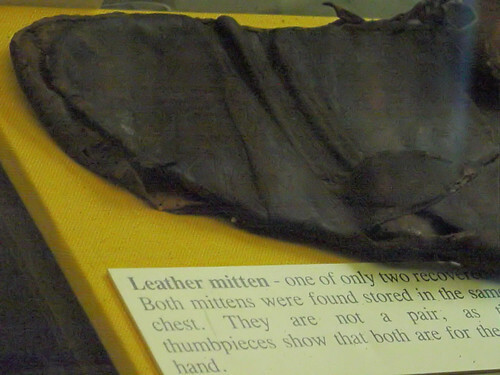 The leather was stitched with the flesh sides together, then turned inside out so the seams were hidden/protected. 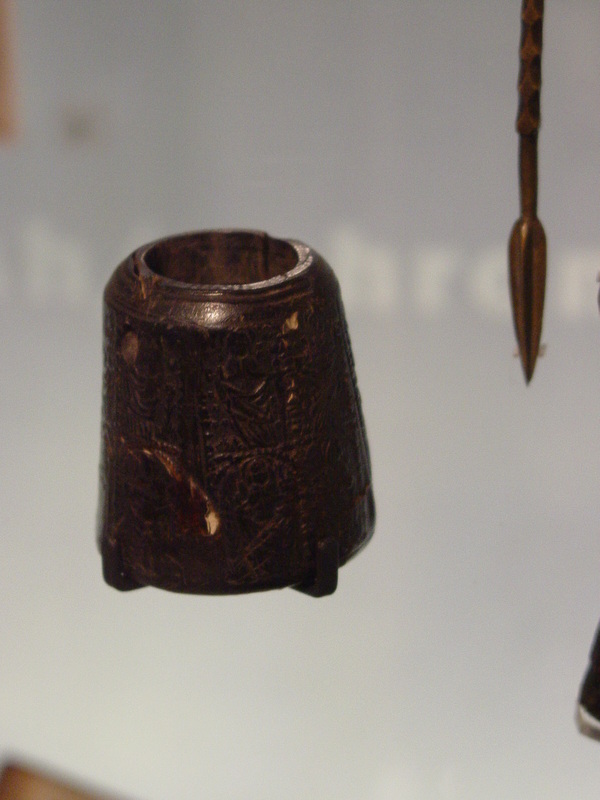 Mary Rose arrow spacer. These would commonly be used with a linen canvas bag and be slung off a waist belt. 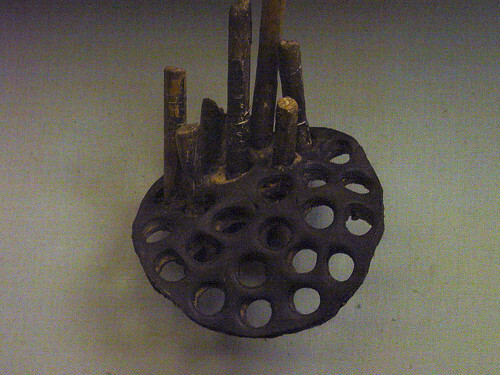 Mary Rose arrow spacer with the remains of arrow shafts in situ. These would commonly be used with a linen canvas bag and be slung off a waist belt. 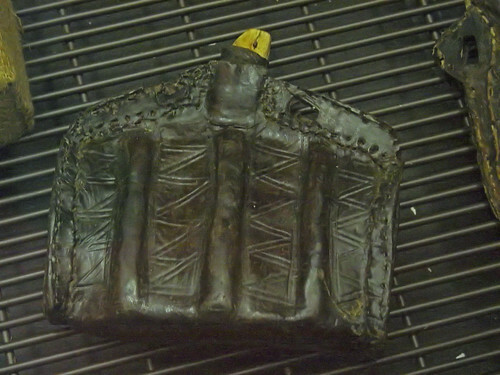 Back of Mary Rose leather flask 79A1232, 282mm high, 213mm wide and 57mm deep. Stitching is original and there is still some sealing pitch present. This bottle is asymetrical - the front is much more deeply curved than the back. 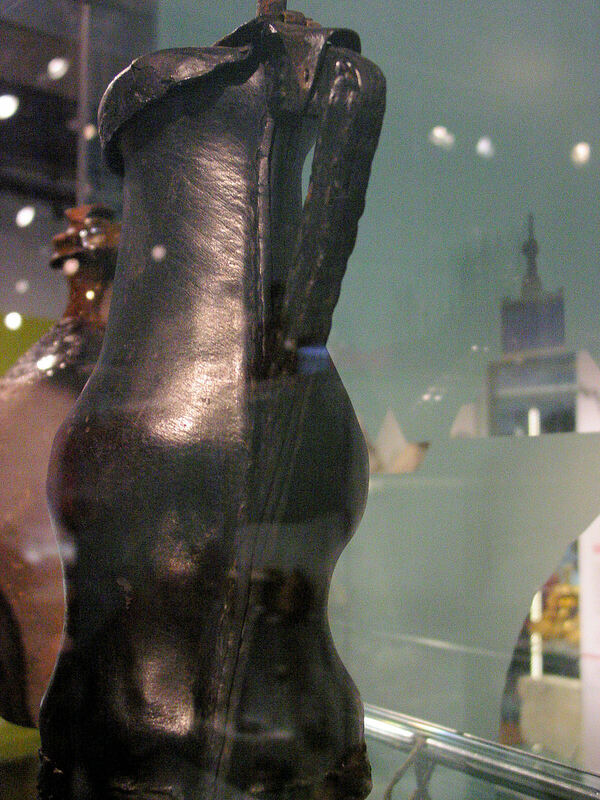 Mary Rose leather bottle of the costrel form, 81A0881. Front is decorated with three vertical ridges with a double zigzag pattern between the ridges and to either side. There are several pairs of parallel tooled lines including a large inverted V and various rectangles on the base and back. The inside is coated with an unidentified subastance. 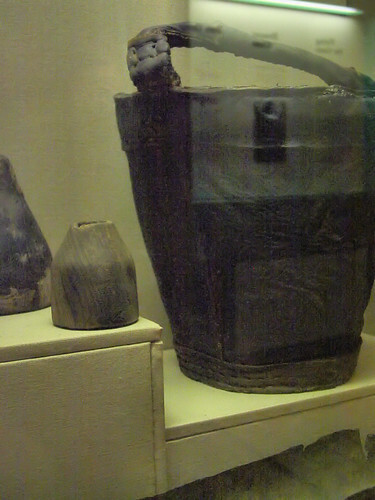 The photo was taken in low-light conditions inside the museum, colours may not be accurate. 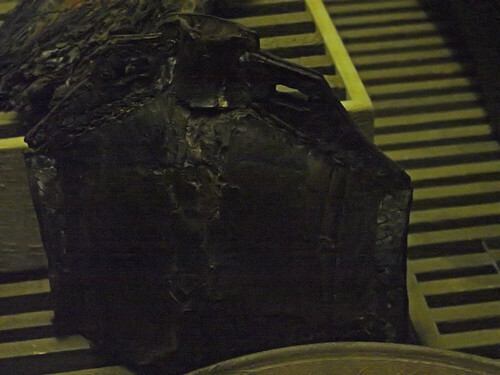 Mary Rose leather bottle of the costrel form, 81A1214 was found in a chest along with some personal items and woodworking tools. Front and back are decorated with five pairs of parallel lines from top to bottom, framed by a horizontal line at the base and two parallel lines across the shoulders and neck. There are two asterisks on the base, with a saltaire cross (X) diagonally between them, and a saltaire cross on each end. There are reinforcing pieces in the shoulders/lugs and a gasket piece around the inside of the neck. There is the remains of a waterproof coating on the inside surface. 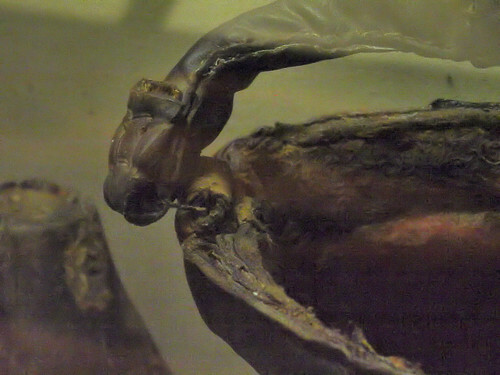 Reconstructed Mary Rose leather bucket. 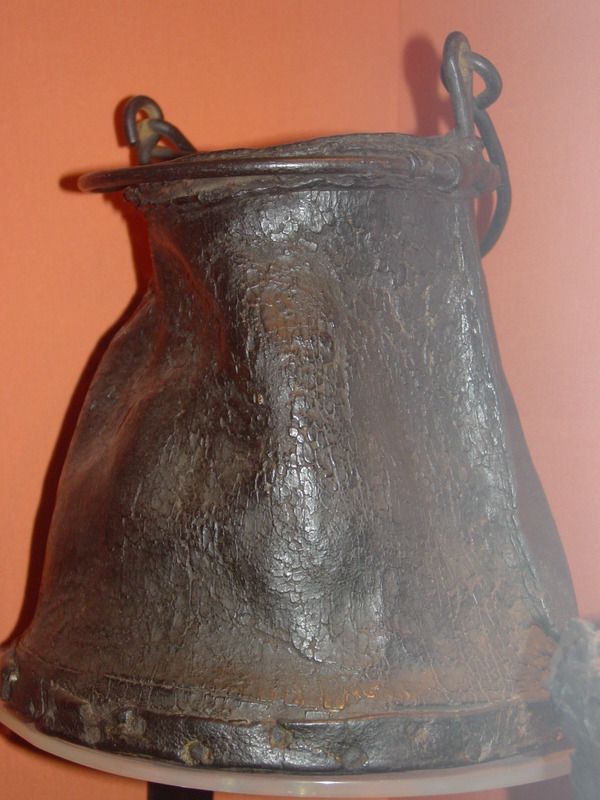 The leather buckets all have rust marks from iron handle rings and some have the remains of pitch sealing, indicating they were water rather than powder buckets. 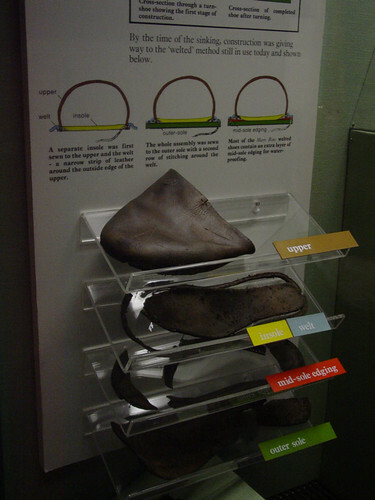 Height separated welted shoe components from the Mary Rose (possibly 81A1861) showing the way the layers go together. The colour of the label corresponds to the colour code on the chart behind. 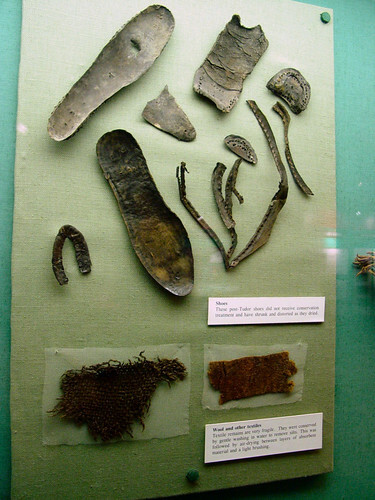 Assorted shoe parts found in the 2002/3 dig. Shoe quarter from a type 1 shoe, displaying a topband in place. 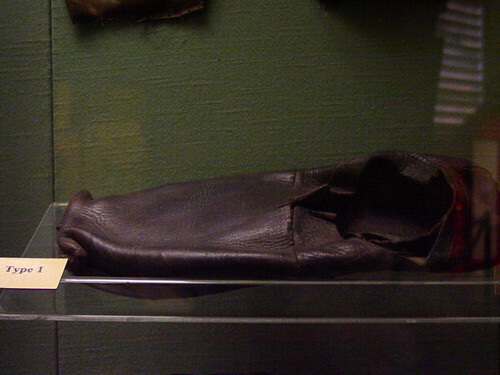 Type 1 shoe (high slip on with the throat raised by the extension of the front of the quarters). 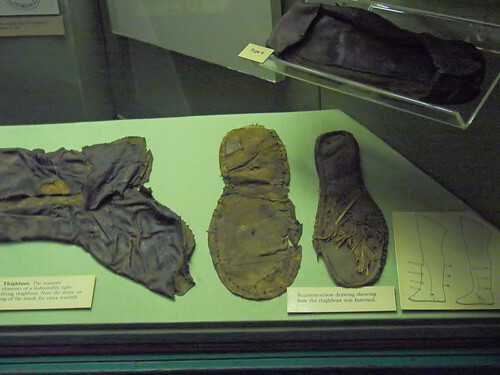 Museum display showing the differences between type 1 (high slip ons with the throat raised by the extension of the front of the quarters) and type 2 (slip on shoes with straight throated vamp and straight top edge on the quarters. Replacement partial shoe sole cut from an old bucket. The shaded area indicates which part of the bucket the sole was cut from. 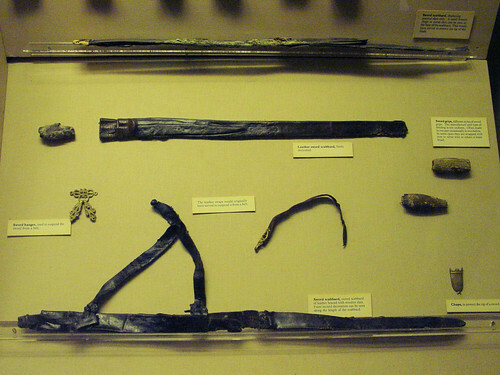 A display of leather scabbards from bollock knives (top, centre) and a rapier (bottom) together with the copper alloy fillings used to support them. 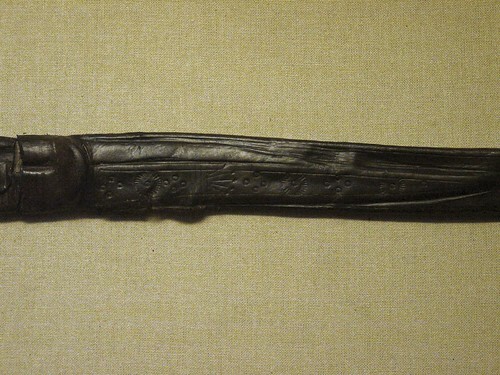 Rapier scabbard with incised decoration and hanging strap. 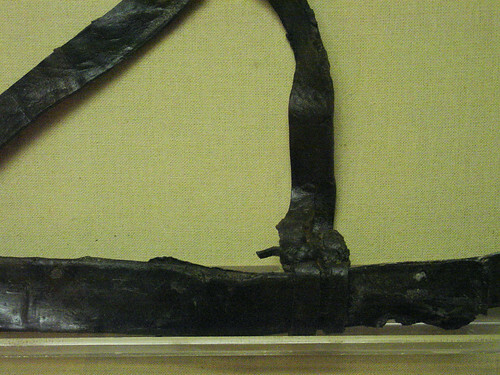 Mid-section of rapier scabbard with incised decoration and hanging strap. Mary Rose bollock knife scabbard with stamped decoration, the scabbard has two compartments, one for the bollock knife and one for a by-knife. Fine embossed bovine leather, 275mm x 190mm showing the inner flap and the inside of the outer flap. 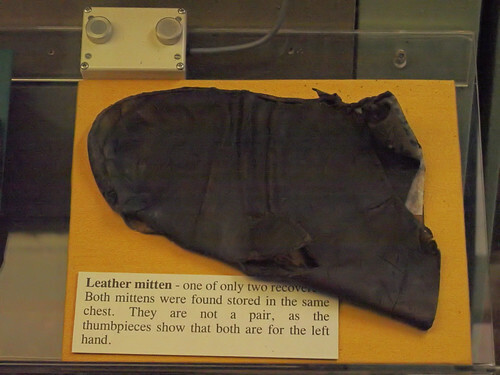 Outer flap is lined with silk, the inner flap is two layers of leather stitched with the skin sides together. Detail of the silk inside of the outer flap of 81A2685, 275mm x 190mm. False colours due to low light levels in the museum. 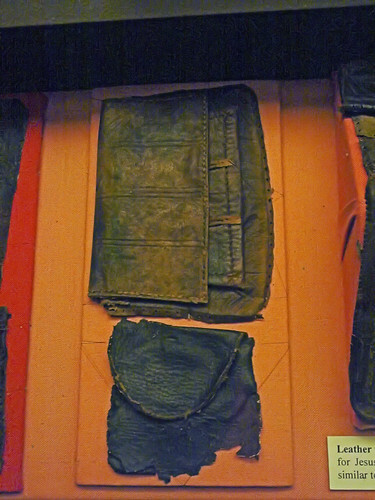 Top:An unidentified Type 1 Leather pouch Bottom: An unidentified leather pouch. Fine embossed calf leather, 278mm x 197mm. The inner flap is plain. Type 1 pouches have two sections for storage, the larger is the same width and height as the outside of the pouch, the smaller is stitched in position between the inner and outer flap. Unlike the other type 1s, this one has a third pouch in front of the others. Something a little different this time. You may take this as either something a little off-beat with leather or me just showing off again. Or both, I’m still rather pleased with the result as this was my first attempt at sculpting. Our younger child was one of those kids. Immediately after an act of the utmost diabolical evil, he’d suddenly turn into someone so incredibly sweet you’d momentarily stop contemplating infanticide. His grandmother didn’t like the only name to which he would respond, Destroyer of Worlds. To Nana, he was Prince of Imps. So when we were invited to a Renaissance Masked Ball, he simply had to go as the Lincoln Imp. The Imp at a recent banquet, no doubt looking for a Bishop to trip. 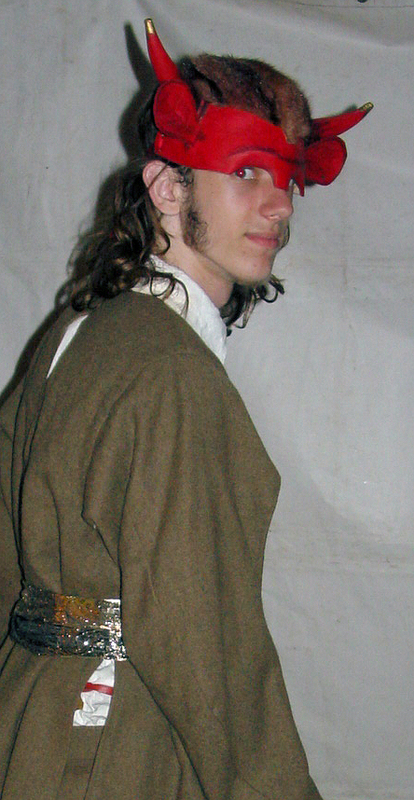 His clothing is the latest fashion in the 1640s, every stitch hand sewn by Glenda. 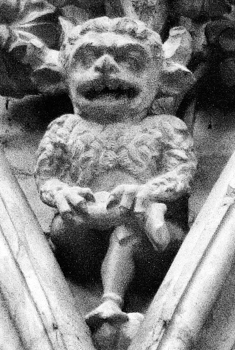 According to a 14th-century legend two imps were sent by Satan to do evil work on Earth. After causing mayhem in Northern England, the two imps headed to Lincoln Cathedral where they smashed tables and chairs and tripped up the Bishop. When an angel came out of a book of hymns and told them to stop, one of the imps was brave and started throwing rocks at the angel but the other imp cowered under the broken tables and chairs. The angel turned the first imp to stone giving the second imp a chance to escape and end up in another group of stories. So even in the 14th century, they knew the pulling power of a sequel. The imp mask was made from five pieces. Two for the horns, two ears and the skull-cap. The horns are simple cones, cut as a segment of a circle with the two straight sides held together with edge-flesh stitching. A small wedge was taken out to help with the curve and stitched the same way. The horns were then dampened and stretched into the curved shape. 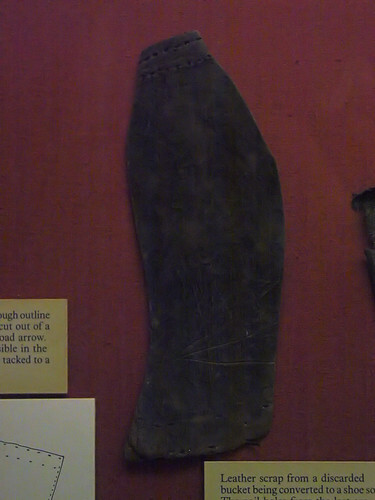 Ears were simple leaf shapes with folds and veins embossed with a butter-knife. I chose to give the imp an earing with a flower-shaped stamp. 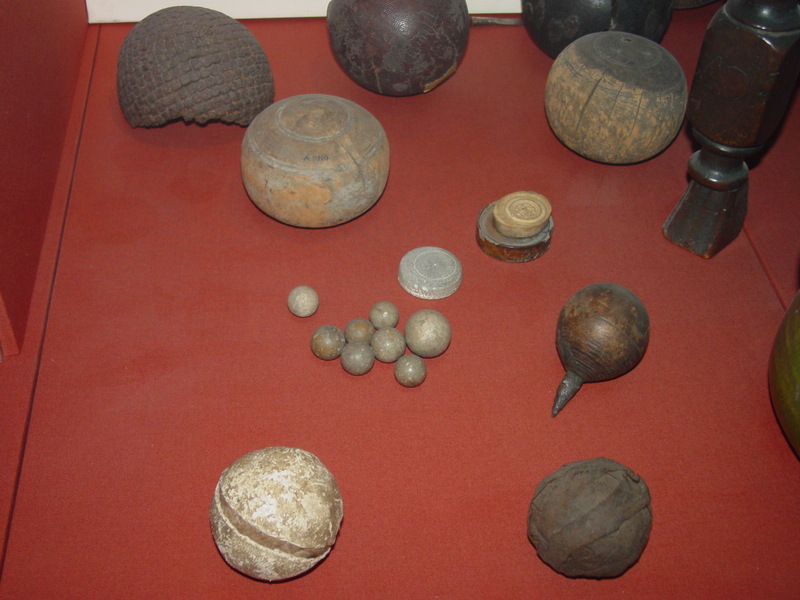 The skull-cap was a larger circle, with a small wedge taken out either side of the forehead and one in the middle. These edges were also secured with edge-flesh stitches to give it a curve. The eyebrow ridge was worked through from the back and hairs were then embossed from the front with the edge of the butter knife this time. 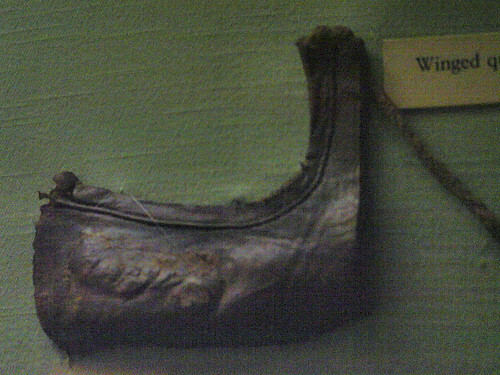 The ear showing the embossing and ear-ring and the top seam on the horn. 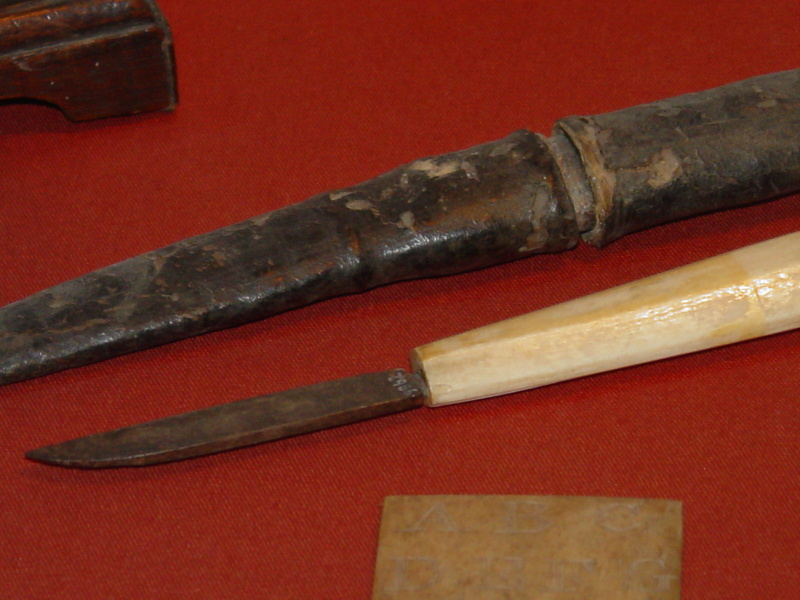 The “stalk” of the ears were pushed through slits in the appropriate places and secured in place with a couple of stitches, and then curved along the long axis to give them a bit of strength. 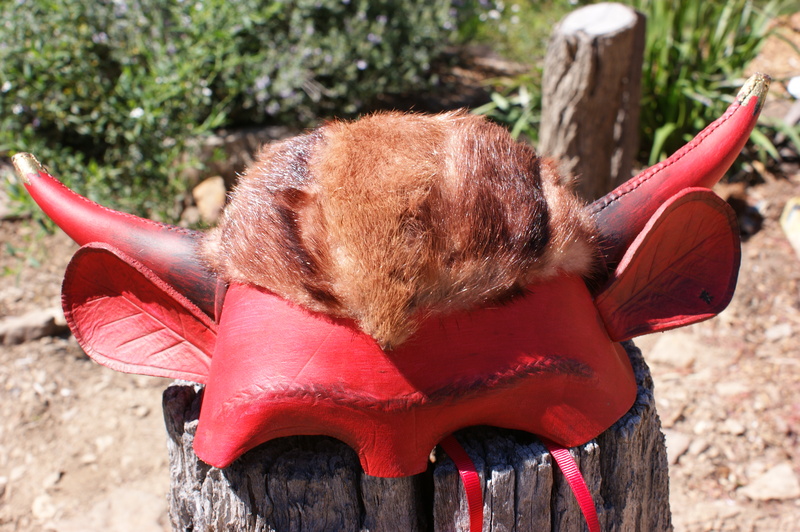 The horns were sewn to a couple of strips of thin leather, which was then rolled and stitched to the skull. Inside of the mask, showing shaping seams and ear and horn attachments. The small shaping seam under each horn can also be seen. Selected red and brown paint to finish, with water gilded tips of the horns and earing. Once the paint was dry, I glued on some fur from an old fur jacket paying attention to the fall of the nap so it resembled the statue and covered all the seams. The ensemble was completed with a pointy tail. It’s had a couple of uses since it was made, and the son has settled down and become a lovely man in the intervening seven years. Infanticide is now only very rarely considered. Finished mask showing fur, goldwork and eyebrow embossing. Some more photos from out trip to the National Gallery of Victoria. I was going to say “recent”, but it was back in January. I’ll stick to details from the paintings, if you want to see the whole image visit the gallery’s website, get a catalogue from your local library or go the gallery. The NGV has a largish selection of 17th century English and Dutch art along with a substantial collection of earlier art. During the reigns of Elizabeth, James and to a lesser extent Charles and the interregnum, English middle-class Protestant fashion tended to mirror the Dutch fashion, largely due to the influence of Dutch refugees from the Spanish occupation. This is fortunate as it means we can draw from a wider range of art than would otherwise be the case and it comes from a time when the Realism style was on the ascendency. The van Velthuysens made their fortune trading with Italy, so sit at the upper end of the middle class. 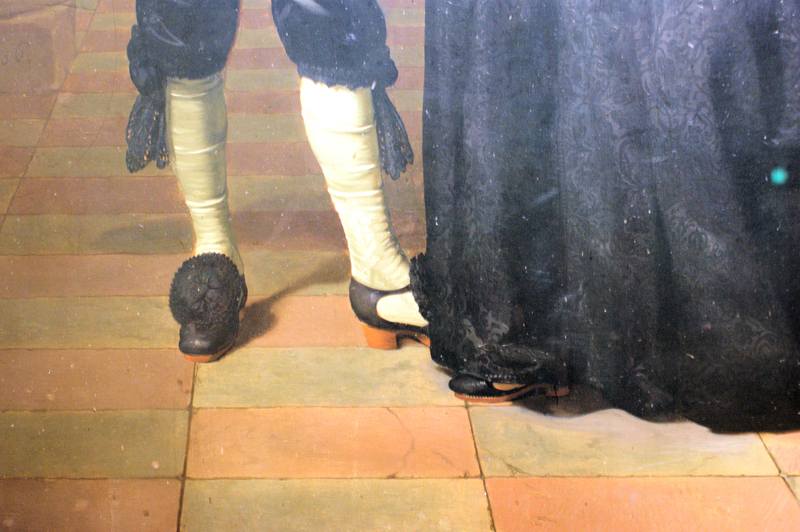 Probably a marriage portrait, both figures wear latchet shoes with very large cut-outs. The heels appear to be stacked leather, if you embiggen the picture, you’ll see the individual stitches in the welts. Josina has smaller shoes than her husband, tiny feet by modern standards, but otherwise both pair of shoes are remarkably similar. David Teniers II, "The Gazette" (c. 1635). 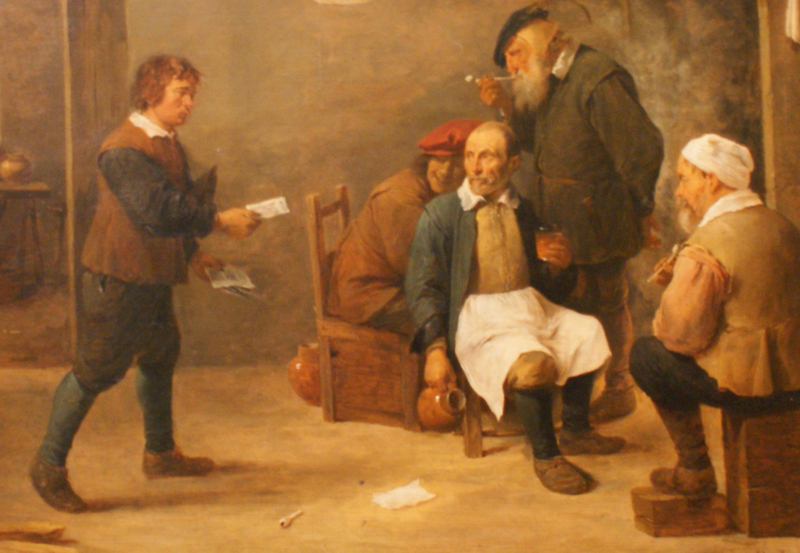 David Teniers the Younger, a Flemish artist born in Antwerp depicted a typical pub scene of the period. The figures are mostly from the lower end of the social scale, their shoes are solid, heavy and largely unadorned. 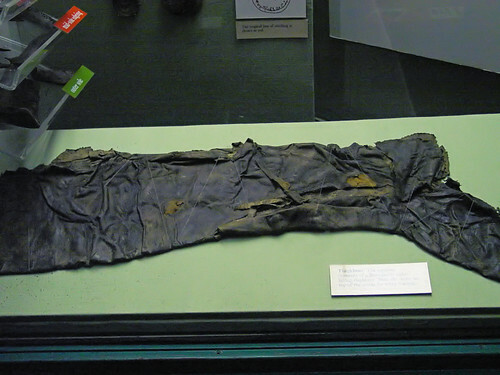 There are no cut-outs in the sides, the boy may be wearing a leather jerkin not unlike those from the Mary Rose. 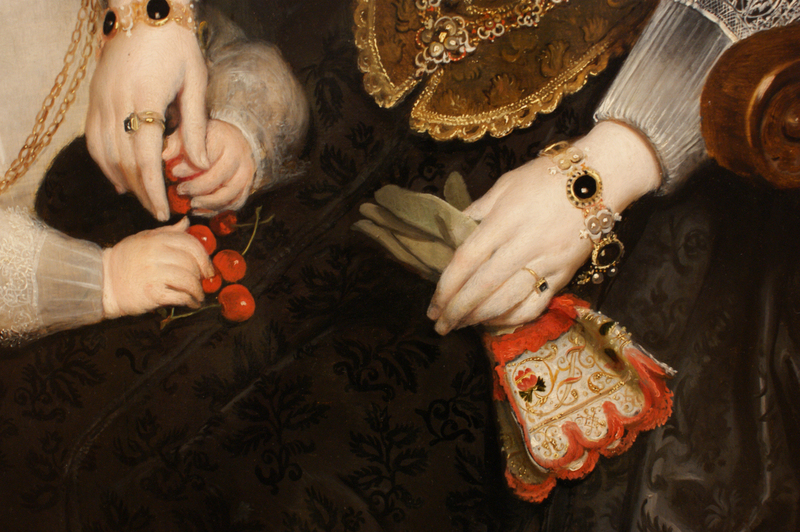 Mytens was a Dutch artist working in England between 1618 and 1635. Ashburnham was Member for Hastings from 1628 and was also Groom of the Bedchamber of Charles I. 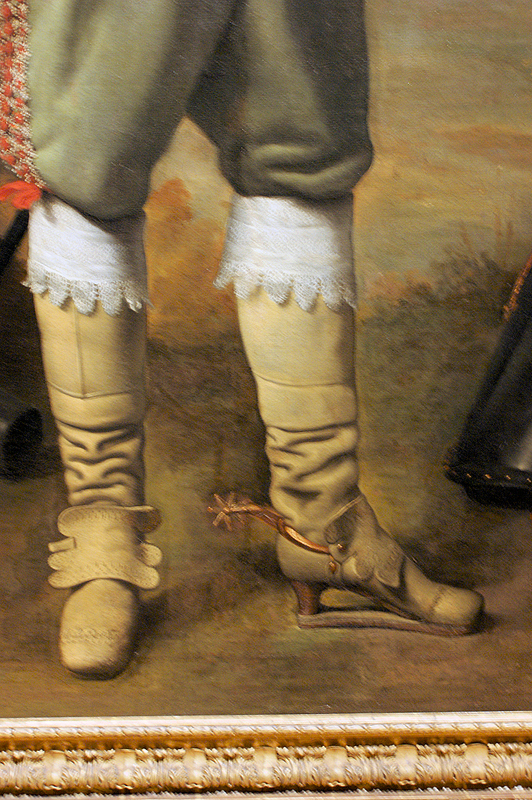 In this painting, he is wearing a pair of buff leather boots with probably a wooden heel and a slap sole. 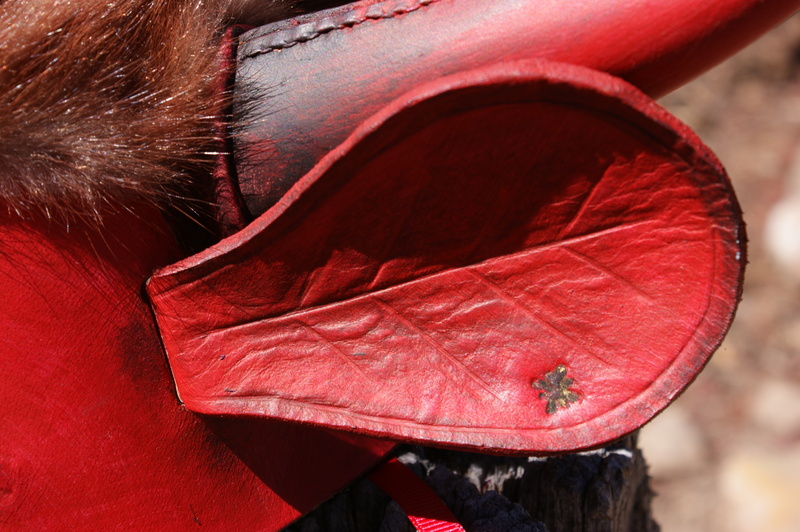 There is a seam between the vamp and quarters that is hidden behind the spur leather. 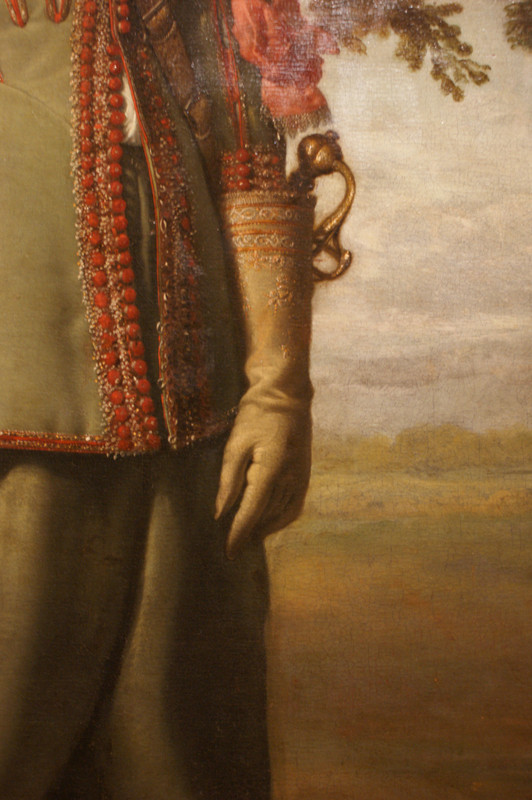 Ashburnham’s gloves are shown in the detail below. 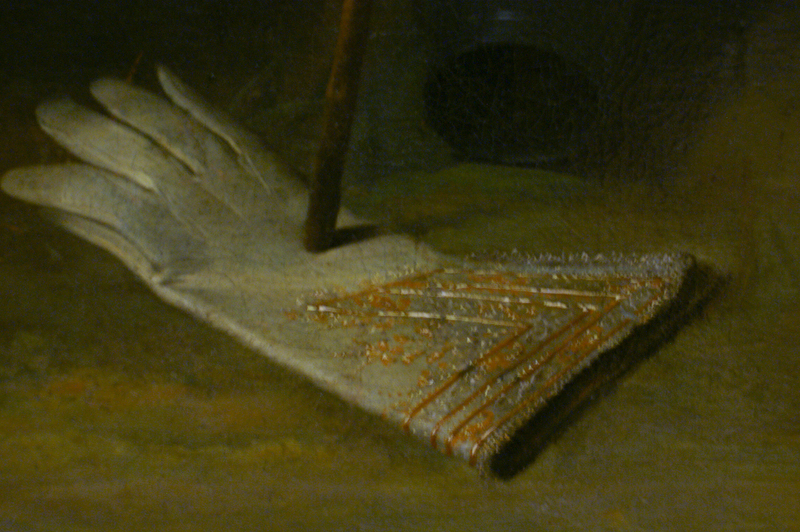 The right glove has been casually dropped on the ground and is pinned in place by his cane. I suspect it’s made of buff tanned deerskin, not unlike chamois. Decoration is silver and gold wrapped silk laid and couched. Ashburnham still wears his left glove in his left hand. In the image above, you can see more of the embroidery on the back of the glove cuff. The baldric is also visible. de Vos was a Flemish artist working in Antwerp. The mother in question is a Catholic, shown by both the crucifix and the richness of her clothing. The gloves are finer, but similar to those worn by Ashburnham above. 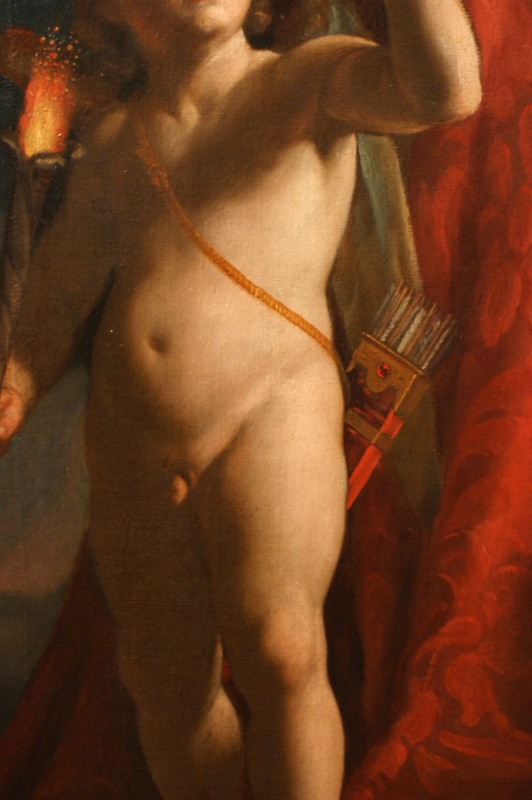 Painted while Turchi was working in Rome, Charity is accompanied by a cupid wearing a quiver similar to one hanging in a tree in the contemporary “Diana and her Nymphs after the Hunt” by Jan Brueghel the Elder and Hendrik van Balen. More on that one in another post. These photos are from our visit to the Museum of London in 2006. The light levels in the museum can be quite low, so the photos sometimes are underexposed. The level of detail on the placards was also fairly limited, but most of these items have been published by the MoLAS if you want to read up further. I’ll keep the captions brief and to the point. 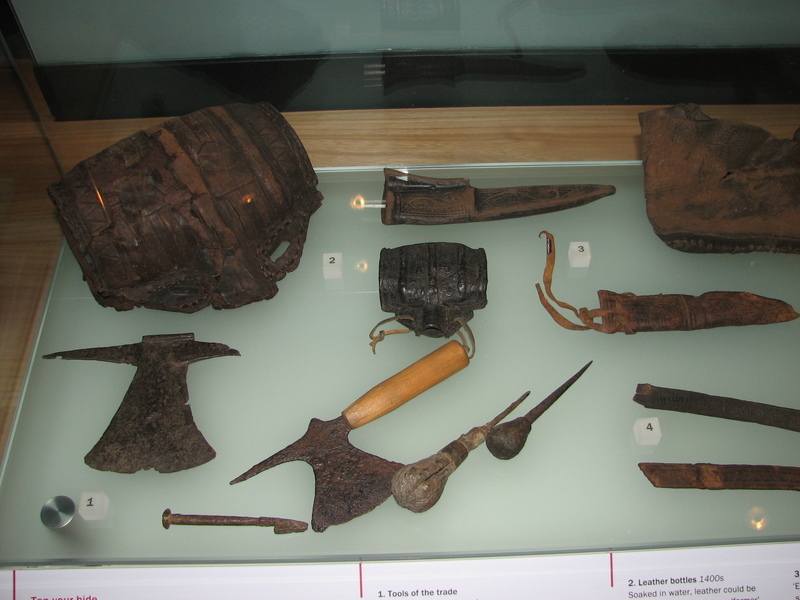 Roman leatherworking tools found around London, 1-3C AD. 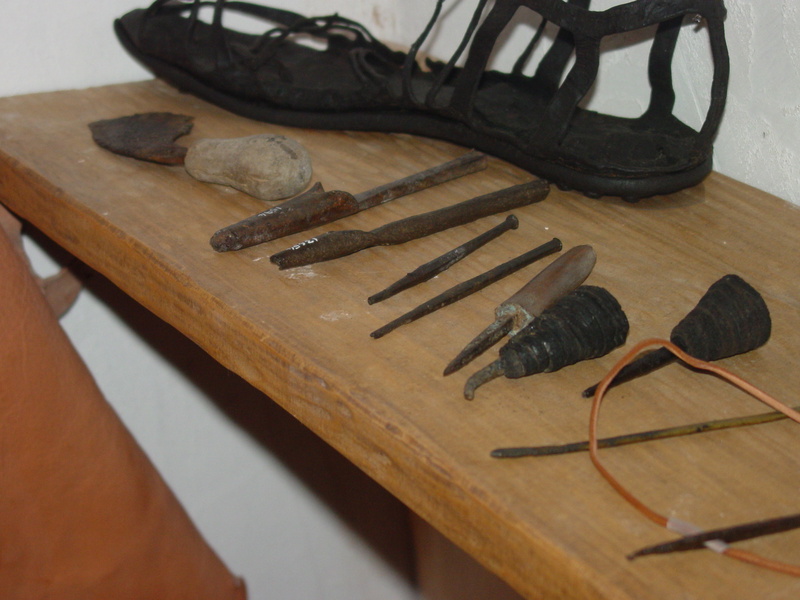 Leatherworking tools, about 14th century. The small costrel in the middle is often cited as evidence for sand moulding. I can't see how you'd sand mould the ribs or why you'd need to once you'd moulded the ends and neck. 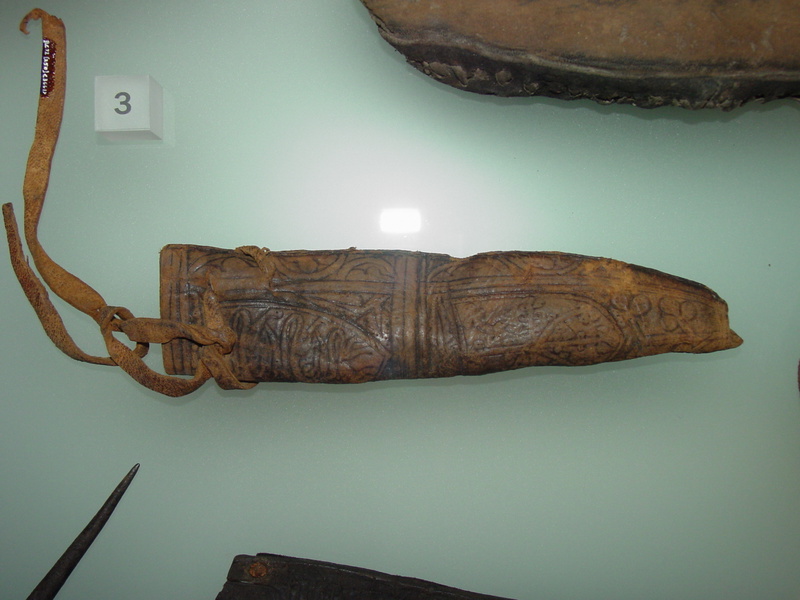 Small decorated knife sheath, 15th century. 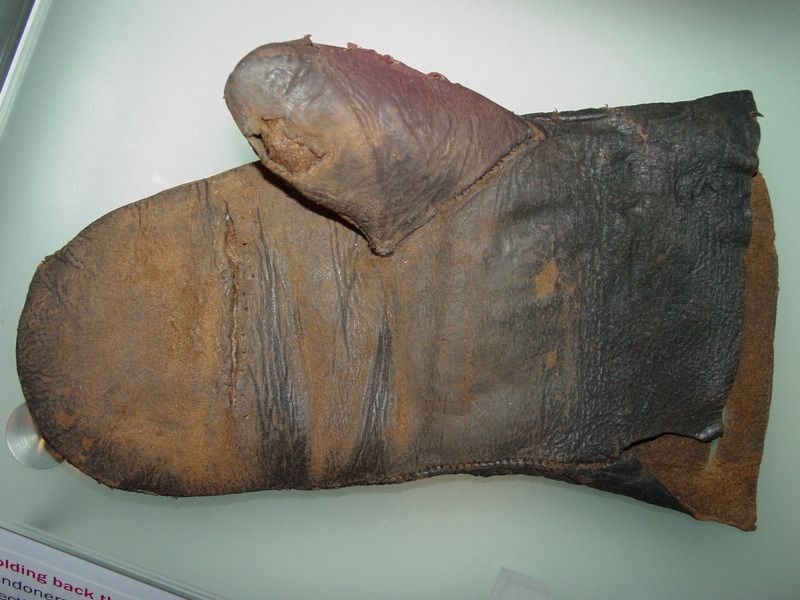 Leather glove, 15th c. from Bankside Southwark. The cutout for the thumb stall is teardrop shaped, there is a repaired tear across the mitten. 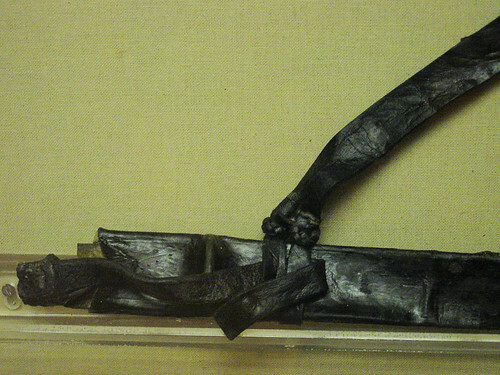 Leather costrel, 1400s. More on these in a later blog. 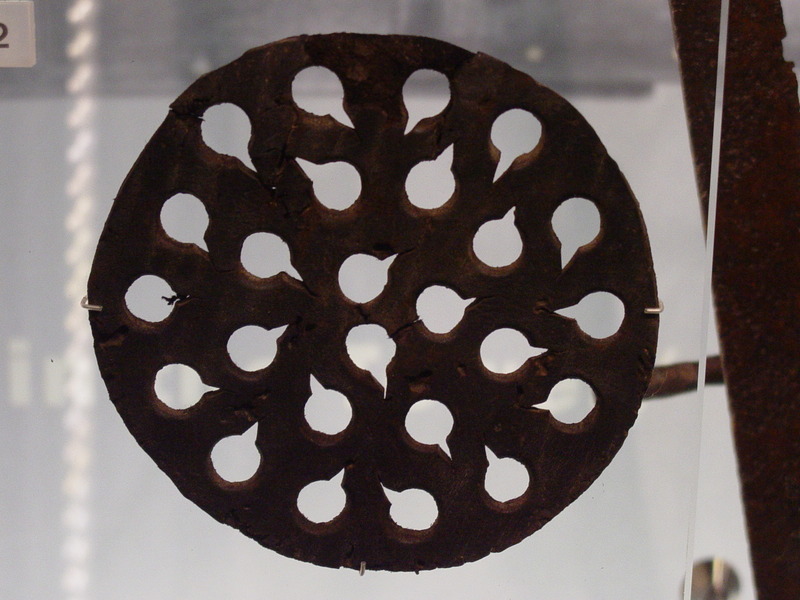 Arrow spacer, 1400-1500. These were sewn into linen arrow bags, protecting the feathers from crushing. The small notches allow small broadheads to pass through. We've made a copy of this one and found it worked really well. 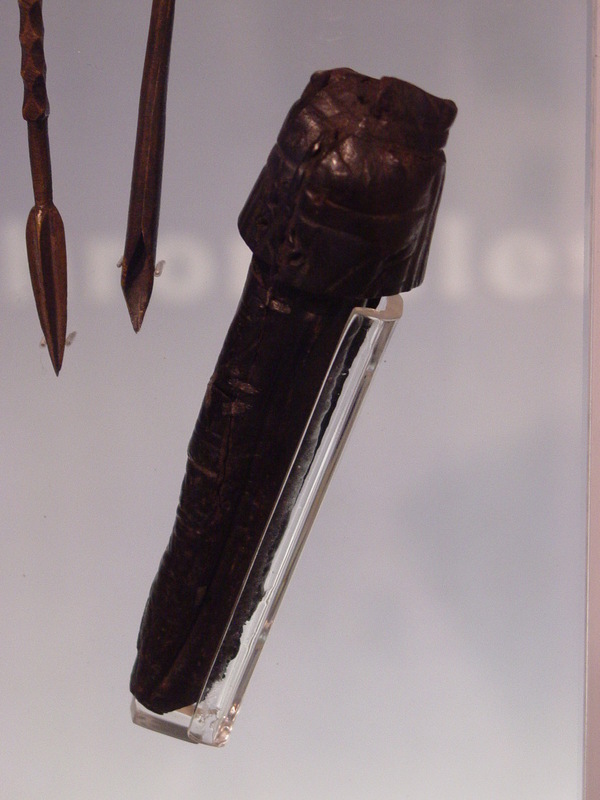 Archer's armguard, 1500-1550. 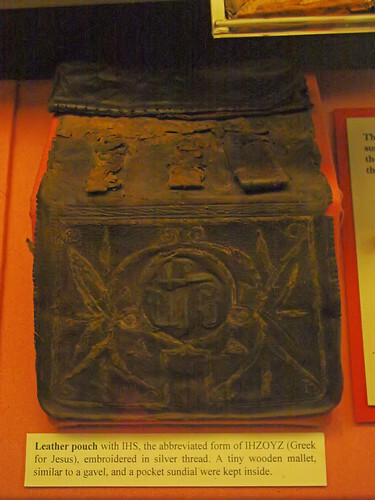 Found in Worship Street, another of virtually identical shape was found in Newport, Wales. Stylus case for holding styli for use with wax tablets. 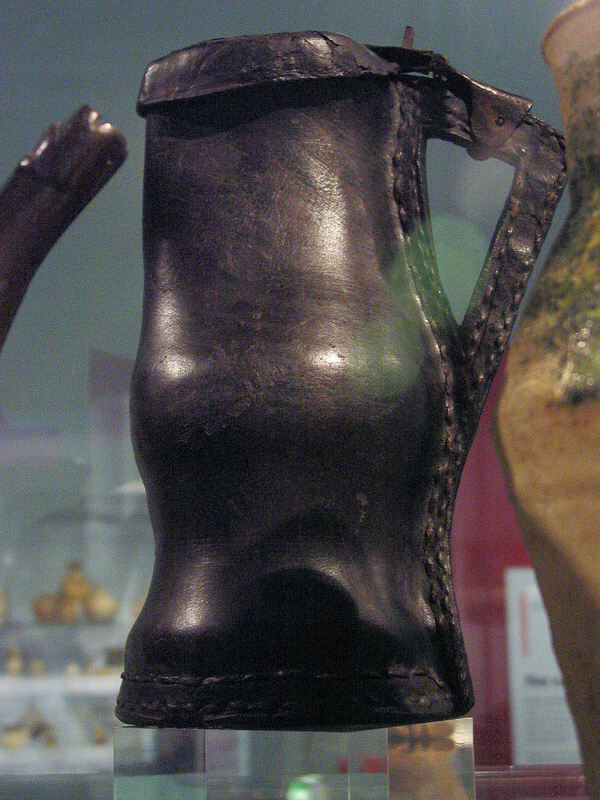 Jack, 15th-17th century from the shape of the handle - the pewter lid is a later addition. Compare this with the ones at Warwick Castle. Jack, handle view. The twist in the body is caused by uneven tension when sewing the back seam. I've only done it this severly once. 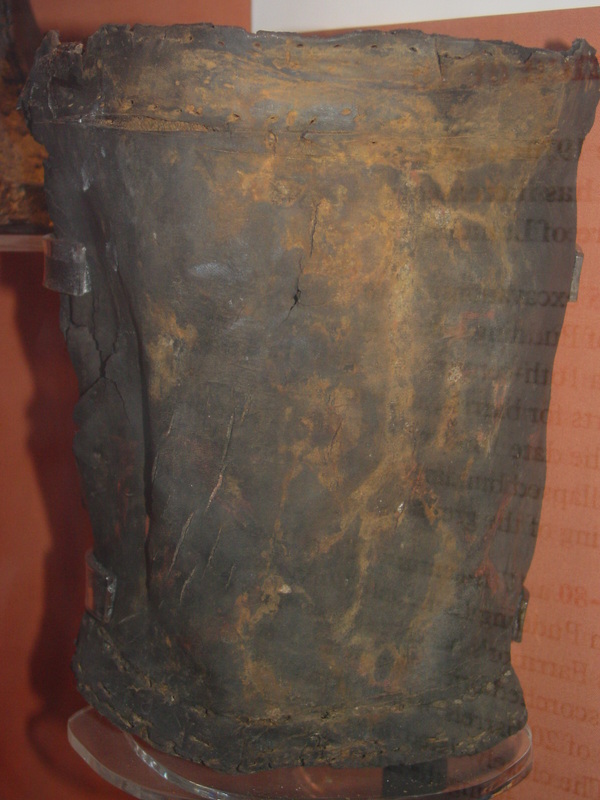 Iron-bound leather fire bucket. I suspect this is late 17th century or even more recent. 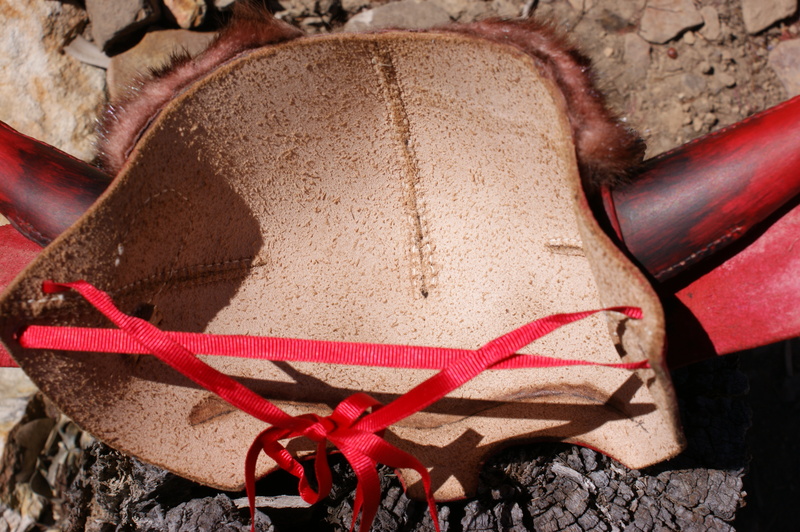 Sewn leather fire bucket. 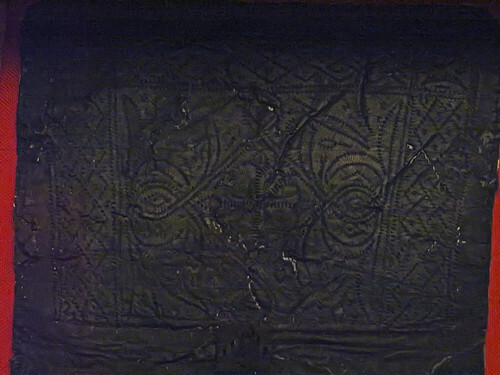 Decoration is painted, the letters "SB" on the top row, "B" in the middle and the date "1666" on the bottom row. Pen knife and moulded leather case. Mid-17th century. Front left: Leather tennis ball, stuffed with dog hair. The Reverend's Big Blog of Leather by Wayne Robinson is licensed under a Creative Commons Attribution-NonCommercial 4.0 International License. A Medieval Craftsman A Chronicle of Projects from the Roman to Middle Ages – all materials, not primarily leather. Garb for Guys: Leatherwork A gentleman outfitting himself in the finest late Renaissance fashion. I’ve just linked to his leatherwork but the whole site is worth a look. Medieval Colours Experiments in medieval painting techniques and the paint components. 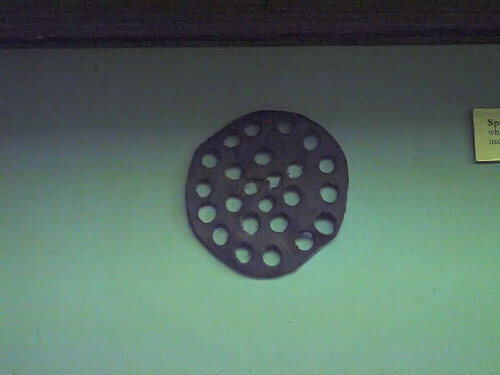 Robin Wood – Woodcraft Yes, I know it’s not leather. You’ll understand when you see his work. The Reverend's Emporium My storefront for re-enactment equipment, wargaming figures, model railways and more. The Villiage Carpenter A woodworker with a great approach to hand tools. If I had half this level of skill with timber, I’d be happy. Try! Great re-enactment blog with something for everyone. In Swedish, but Google translate seems to be up to the task. Where Are The Elves? 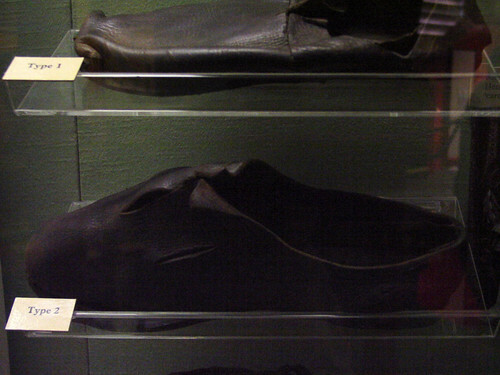 Reproduction Medieval period shoes the hard way. I like his approach, it’s similar to mine. Baggie's Blog My son’s blog reviewing video games. Construction and Care of Spanish Botas at Sal's Virtual Tapas Bar The bota is a cousin of the bourget, evolving from a common ancestor. 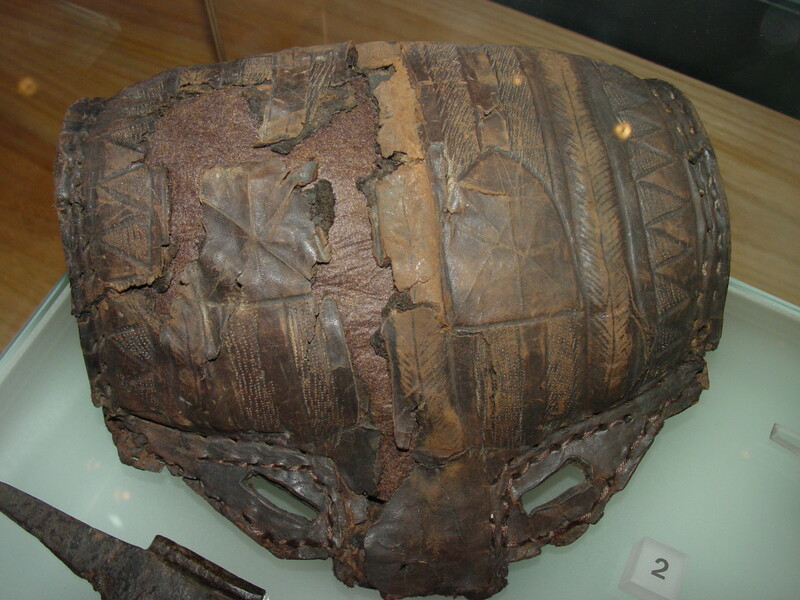 The construction and sealing are similar to English leather vessels as are the rules for care and feeding. Red Ned Tudor Mysteries A great series of fiction books set in Tudor England. I’m been involved in a couple of the stories as a technical consultant on leatherwork. The Reverend's Emporium My shopfront with a small but increasing amount of stock. Lorenzo's Workshop Some nice practical leatherwork with an emphasis on the 15 and 16th centuries. The International Routier – The Blogge Online magazine of the Pike and Musket Society – I’ll be putting all my pottery, woodwork and horn and bone articles here. The Worshipful Company of Horners The Horners were joined by the Leather Bottlemakers in 1476. Worshipful Company of Glovers The Company was formed in 1349.